BRUNSWICK — Residents of “the home of the iron horse” are getting a say in how their city will be known in the future. When Mayor Carroll Jones looked around at changes in his city last summer, he saw a large residential development in Brunswick Crossing and downtown revitalization projects in the works. Jones did not want to dismiss Brunswick’s long history as a railroad town, he said, but he decided the city should embark on a rebranding project that would incorporate the best of its history, along with its hopes for the future. Jones asked Christina May, chairwoman of the city’s Economic Development Council, to spearhead a group that would solicit and organize residents’ thoughts on the project into a cohesive brand, including perhaps a new city slogan and logo. May, public relations director for Pleasants Development, builder of Brunswick Crossing on the northwest side of the city, contacted 32 community organizations, including the local chamber of commerce, Brunswick Main Street, and church and senior groups. Over several months, May and others videotaped for later transcription the focus group sessions that included more than 200 residents and neighbors, new and old, she said. “It really is quite the community pride project, and that, for me, is really quite moving,” she said. The rebranding group asked these residents about their favorite thing about Brunswick, their impression of the railroad, the city’s strengths and weaknesses, and what they would do for the city if they were given a blank check, May said. Most residents responded with the same themes, she said. 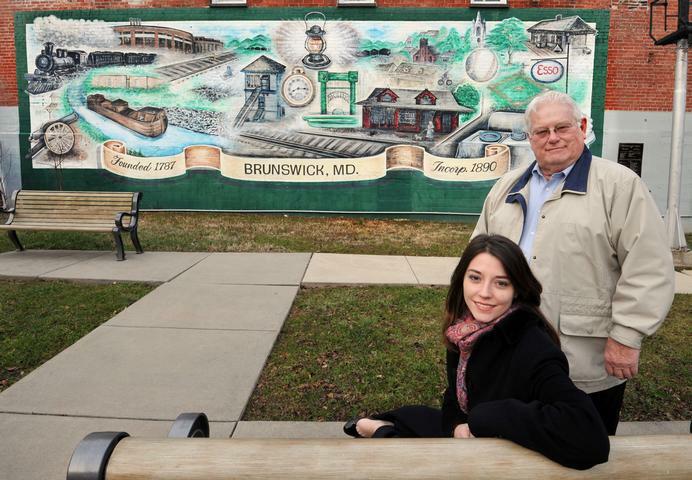 People do not see the railroad as the only thing that defines Brunswick anymore, though they are proud of its history. Recreational opportunities, from the C&O Canal to the campground to the city’s 60 acres of parks, are now vital to the quality of life residents enjoy, she said. Sports are also big, particularly baseball, she said. This July, Brunswick will host the state Little League tournament. From the end of August through mid-October, Brunswick’s Kaplan Building on West Potomac Street will be among five sites statewide to house the Smithsonian Institution’s Journey Stories exhibit, May said. The Brunswick Railroad Museum and the Brunswick Public Library are hosting the exhibit. The city’s place as a historic transportation hub, even before the advent of trains in the area, will also play a part in the branding, she said. Residents who could not make it to the focus groups will be able to provide their input at the city’s website, she said. The branding group will eventually put out a request for a professional to draw up a graphical representation of the city’s new logo, May and Jones said. The group plans to present the city in June with a strategy document for implementing the brand.